Johnson, 32, and her husband were on the last stop of a Caribbean cruise June 2 when shark attacked her. An ordinary snorkeling excursion in a shallow reef in the Bahamas turned horrific last week when a shark attack cost a North Carolina mother of three much of her right arm. "It just felt like I had bumped into something, so I just casually turned to my right to look . . . my whole arm was in its mouth, just floating there," Tiffany Johnson told ABC affiliate WTVD from her Concord, North Carolina, home. "I kept trying to yank my hand back and the last time I yanked, he had cut it clean off so I was able to actually get free," Johnson told WSOC.com. Johnson, 32, and her husband were on the last stop of a Caribbean cruise June 2 when the attack occurred and Johnson said her ability to stay calm, along with her religious faith, enabled her to survive. Doctors were unable to save her arm, which was amputated just below the elbow. 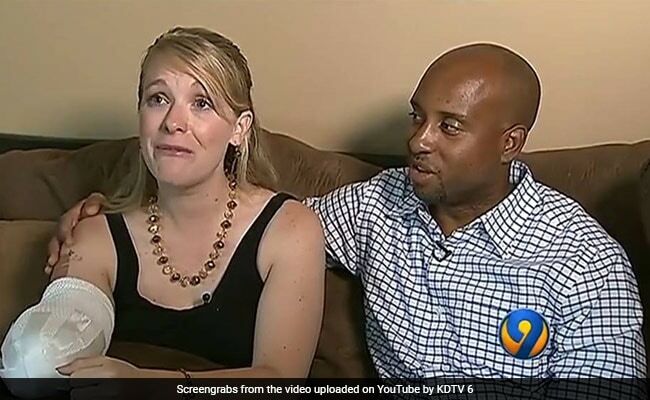 "She felt her arm, like a small tug on her arm," her husband, J.J. Johnson, told WBTV. "She casually looked over to her right to see what it was and she was staring face-to-face at the shark." What was believed to be a tiger shark attacked fast, as Johnson was watching her swim from a boat. "When she realized what was happening, she tried to pull her arm out of the shark's mouth and that's when the shark clamped down tighter," he said. "They struggled there for a second and as she tried to pull away, the shark bit her arm off." When he heard her screams, Johnson said he jumped into the water. "I looked over there and I just saw blood all over in the water, all around her," he said. "She's saying, 'Help me, help me, Jesus' and she's praying as she's swimming back." Johnson said she "felt this tangible peace on me and it was so thick, that I was just calm." She is home now after what she hopes will be her third and final surgery. "Who cares about a limb?" she told WBTV's Sarah-Blake Morgan. "It's a limb and I'm here." The incident left Johnson "thankful to be able to share this story and I hope, and I know, that it's going to change people's lives because you can't hear this story and not see God in it."